Featured are some of the County's award-winning programs. 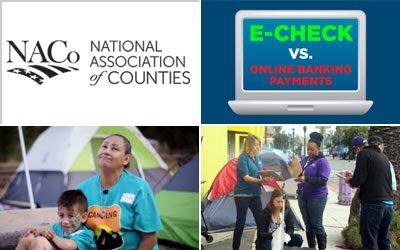 The County of San Diego received 41 awards from the National Association of Counties (NACo) for innovative government programs. “As a County, we are always striving to improve our services and address unmet needs, so it is heartening to have 41 programs recognized for those efforts with an Achievement Award,” said Supervisor Kristin Gaspar, chairwoman of the Board of Supervisors. The winning programs are from various departments including County human resources, public safety, health and human services, parks and libraries. San Diego County programs received the second most awards in the state, trailing San Bernardino County by one award. NACo selected 615 programs from among 116 counties and state associations in 29 states for its Achievement Award. The Best in Category was given to one award in each of the 18 categories. A San Diego County program, Person-Centered Service Coaching, garnered a Best in Category award in the Personnel Management, Employment and Training category. The program came from HHSA and helps staff understand how to approach customers with complex set of needs and circumstances. As part of that, intake workers can share information provided by customers with other departments or agencies, so, for example, victims of crimes such as domestic violence no longer need to repeat their stories every time they are referred to another department of agency. This approach is being taught to supervising line staff who then train other employees with the goal to give people better outcomes for the services they receive from the County.